World-class weather radar plus your up-to-the-minute weather report. People often want to check the weather quickly without navigating to a separate Web site. 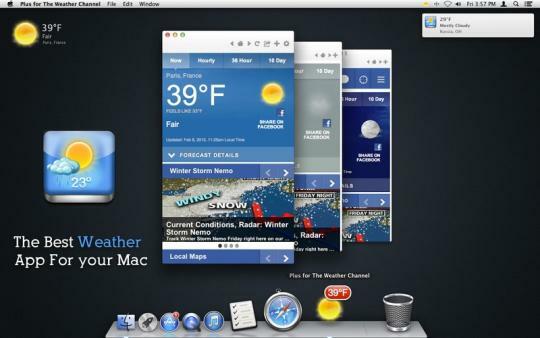 Plus for The Weather Channel for Mac, despite its small price, has a number of features for tracking the weather from the desktop. Available as a paid app for $1.99, there is no free version for trial. 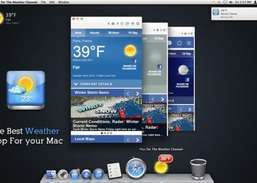 Since Plus for The Weather Channel for Mac is purchased through the Mac App Store, download and installation completed quickly without any user actions. Technical support appears limited to program updates, and there are no formal instructions. The clean interface is easy to use for anyone familiar with The Weather Channel's main Web page. By default, it lists New York weather, but this is easy to change by searching in the main text bar. You can save favorites and new default locations. Buttons along the top of the display allow you to easily navigate between different forecasts and options. In addition to these basic features, the program's additional indicators provide more notifications. Along the dock, the program icon shows basic weather information, as does a button on the top menu near the wireless indicator. This allows you to quickly check the current weather with one click, saving steps and desktop space as compared with using the full Web site. Get weather alert and forecasts into a small widget through 3D animation. Learn about the current weather conditions and forecast in your city and other places.